Sign up for Broadjam today to follow BrunoCosta, and be notified when they upload new stuff or update their news! 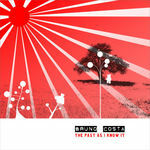 Hi everyone, My name is Bruno Costa and since a few days i started recording at home. This project started with a tremendous passion that i felt inside me. In August i decided to devote all my passion and soul into my songs that i was writing and that´s were all began. During that time, i only lived for music. I kept days, weeks writing, composing and recording with so may pleasure that i can´t describe, but i think that the feeling that i have about music and with my life, is reflected in my music. I play from my soul and psychology and music are my greatest passions. All that i want is to get exposed so that everyone could listen and be identified wih my introspective songs, because all of them have a story to tell. Just listen and let yourself go into the whispers, and you´ll find what i mean. Here i am my friends devoted to you.